The other day I stopped at a village antiques shop. The pleasant woman on duty approached and said, “I have a signed piece of cut glass. Would you like to see it?” Without waiting for my reply she wisked open the display case and waved a celery tray under my nose. “Maple City Glass Company,” she said proudly. “You can see the maple leaf trademark.” Sure enough, you could, by tilting the piece so that it caught the light just so. I admit to being a dab hand at this maneuver (which is taught in Cut Glass 101). Unfortunately, this little scene can develop into a rather ridiculous situation. The novice collector quickly learns the fiction that signed cut glass is preferable to the unsigned. He, therefore, buys only signed pieces. The result is that signed pieces become quite scarce. This drives up their prices. Meantime, the unsigned pieces remain unsold and add to the shopkeeper’s list of woes. The signed celery tray in question remained unsold. It was an example of the innumerable pieces of cut glass whose quality is known, somewhat derisively as “run-of-the-mill.” Only its price was above average. The stories one hears as to why some pieces are signed and some not signed usually include the myth that “only the finest pieces were signed.” Not true. Brand recognition was the main reason a piece of cut glass was stamped with an acid-coated marker, leaving behind an etched signature or trademark, frosted in appearance. This is evident from the wording used by those glass companies that extensively advertised their products. In old ads one finds statements such as “No piece without this trade-mark engraved upon it is genuine” (T. G. Hawkes & Company) and “… [T]he Trade Mark she is proud of — engraved on every piece of our cut glass” (Libbey Glass Company). “Engraved” as used here is what we would now call “acid-etched.”. Many of the major cut-glass companies either did not sign their wares, signed them only during certain years of operation, or used paper labels that were soon destroyed. For example, the Mt. Washington/Pairpoint companies did not sign their cut glass, and C. Dorflinger & Sons and L. Straus & Sons used only paper labels. Other companies did sign their glassware with acid-etched trademarks, but they were inconsistent. Typical of these were O. F. Egginton & Company, the J. D. Bergen Company, and the Hunt Glass Company. And a few companies sent their glass to retailers who requested that the glass sent to them not be signed. They applied their own paper labels or acid-etched marks. The earliest acid-stamped signature on cut glass is probably the “sword” trademark of the Libbey Glass Company. It dates from 1896. This date is especially important because several fine patterns were patented by this company before this date. Because many of these patterns continued in production after 1896, one finds both signed and unsigned examples of them. There is no difference in quality. As the above account indicates, American brilliant cut glass from the nineteenth century did not carry acid-etched trademarks, excepting only Libbey products, beginning in 1896. Spillman states that the familiar trademark of T. G. Hawkes & Company did not appear etched on glass until “about 1902 or 1903,” while J. Hoare & Company’s trademark also was not etched on glassware until early in the twentieth century (Spillman 1996, pp. 28, 142). The Tuthill Cut Glass Company began acid-etching its script signature on glassware about 1910, according to recent research (note 1). If one is seeking fine pieces of cut glass from the early years of what might be termed the “golden age” of American cut glass — say 1880 to 1895 — one will never encounter acid-etched signatures. This fact alone should be sufficient for the beginning collector to ignore (politely) much of the advice that is offered by uninformed glass sellers. “Signed” cut glass, by itself, is no indication of quality. Seventeen years after the publication of this “identification,” the identical tray appeared in the July 1994 issue of The Hobstar (Vol. 16, No. 10, p. 10) as part of a reprinted 1904 ad placed by the International Silver Company. That company obtained its cut glass from the Meriden Cut Glass Company. The pattern in question is called Star, and it has frequently been confused with Hawkes’ Festoon (especially by the Boggesses in their books). Moral: It sometimes takes years before a forgery is discovered. Incidentally, Pearson’s tray lacks the expected Hawkes’ U-notched Rim. The Princess I pattern was patented by Hawkes as design patent no. 18,301 in 1888, but, because the company did not begin acid-stamping its trademark on articles until 1902 or 1903, it is usually not signed. A signed piece of glass cut in this pattern would suggest either that it was a special order, undertaken sometime after 1902/3, or else that the signature is a forgery. The Roman numeral is not part of the original name of the pattern. It is necessary to use it, however, in order to differentiate between this pattern and a later, entirely different pattern that was also given the name Princess by the company. The dimorphic nature of this pattern has been discussed by Evans (note 3). The image of this pitcher in the HAWKES PHOTOGRAPHIC FOLIO reverses the positions of the single star and strawberry (fine) diamond motifs. Although the catalog name for this pattern is Princess, another pattern is named Princess & Hollows which would be appropriate for the patented pattern when shown on a vertical object, as it is here. Unfortunately, an illustration of the Princess & Hollows pattern has not yet been found. 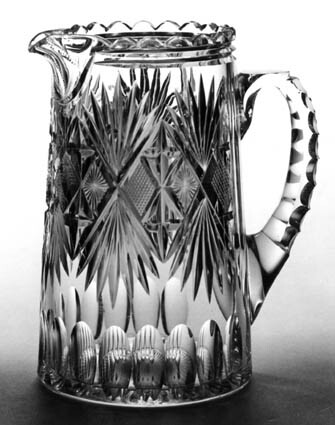 Pitcher cut in the patented Princess I pattern on shape no. 417. H = 8″ (20.3 cm), base D = 4.75″ (12.0 cm), wt = 3.5 lb (1.6 kg). Sold for $225 in 1988. 1. Waldron, A.J., 2000: New sources revise Tuthill history. Part 1, The Hobstar, Vol. 23, No. 2, pp. 10-15 (Oct); Part 2, The Hobstar, Vol. 23, No. 3, pp. 14-18 (Nov). 2. [Chervenka, Mark], 1994: How acid marks are forged, Antique & Collectors Reproduction News, Vol. 3, No. 10, pp. 6-7. 3. Evans, Bill, 1995: Desperately seeking “Devonshire,” The Hobstar, Vol. 16, No. 9, pp. 1, 6-7.